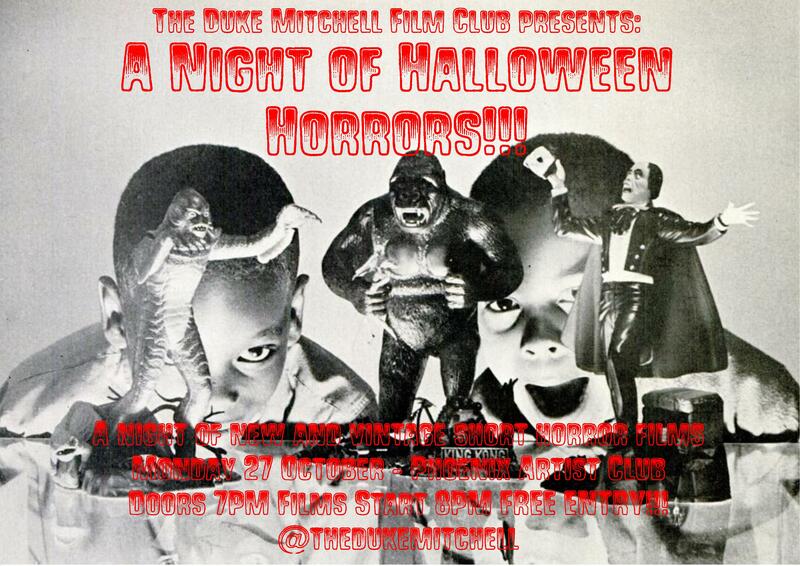 A Night Of Halloween Horrors!!! We’re back at Phoenix Artist Club on Monday 27 October with A Night Of Halloween Horrors – new and vintage horror shorts from all around the world! October means The Duke’s favourite time of the year – yes, Halloween when the temperature drops and the ghost and the ghoulies come out to play! As always The Duke has spent the entire year collecting the best horror shorts out there: from killers, to ghosts, to unexplained happenings, The Duke has something on every subject in order to give you that one good scare – after all everyone gets one! But, of course, that’s never all with The Duke: our Trailer Trash this month will be bringing the best of the most obscure horror films out there whilst our regular quiz will take a spine-tingling turn and who know what other wonders we might expect? So on October 27th, don your best Halloween costume and come on down to The Duke where you’re guaranteed all treats and no tricks! FREE ENTRY! FREE ENTRY! FREE ENTRY!